Want the perfect steak? 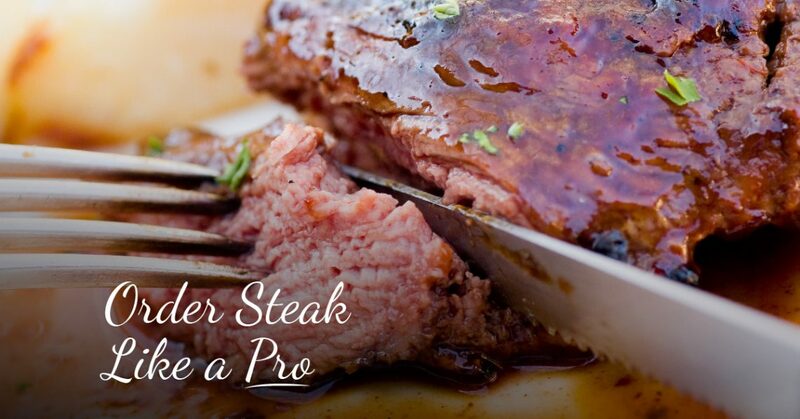 If so, you need to learn how to order steak like a pro! #1. Order the right cut. As we mentioned earlier, as well as in our previous blog, a great steak starts with a great cut of beef. You simply can’t order a flank steak and expect a rib-eye quality meal. If you want the perfect steak, it’s important to make sure that you order the right cut, which for most people, means a rib-eye. Due to the abundance of marbling, rib-eye is considered to be the most flavorful and juicy cut you can buy. #2. Be specific when you order! When you order a steak, you probably have certain expectations in mind. If your expectations don’t meet exactly what the description says on the menu, then you need to be upfront and very specific with your server when you order. After all, your server is not a mind reader and cannot guess as to what you want. You need to tell them so that you can get the steak you are paying for and have been dreaming about. #3. Be clear about how you want it cooked. The debate between rare, medium rare and well-done has been hard fought for years, but the reality is that there is almost nothing worse than a steak that is overcooked. Most people will be happiest with a medium rare steak, but regardless of how you like your steak cooked, it’s essential to be clear about it when you order. Sometimes, rather than simply saying “medium rare,” it’s much better to say that you would like steak that is medium-pink throughout and hot in the center. The clearer you are about what you want, the greater the chance is that you’ll get it! #4. If it’s not up to your standards, send it back! It’s no secret that steak isn’t the cheapest option on the menu, and no one wants to fork over their hard-earned money for a steak that they just aren’t happy with. When you come to Stonewalls, your satisfaction is always our number one priority. That means that when you order a steak with us, we want it to be perfect, and if it doesn’t meet your standards, we need to know about it. Other steak houses may not be quite as amiable when you send back food, but that’s just another reason to turn to only the best steak house in Rapid City. You can’t go wrong with a steak, but ordering steak can be a personal thing for many people. Some people prefer steak that is fully cooked and seasoned, while others would prefer a little pink in the middle with very little seasoning. Whatever your preferences may be, we hope that the above tips will help you order the perfect steak for you every time! Are you ready to experience the mouth-watering steaks from Stonewalls Kitchen? If so, schedule your reservations with us online today!